If we can encourage others, we should encourage them. Someone suggested I write up a protocol for the telephone prayer conferences I regularly host. I thought it was a great idea so here I am. Our prayer meetings are actual conferences. I know some ministries have "prayer meetings" that are recorded sermons or bible studies, so the caller just listens and doesn't participate. This is not a pre-recorded meeting; we talk to one another. We open the meeting in prayer and welcome each other. We typically begin by sharing praise reports. Focusing on gratitude gets our minds and hearts going in the right direction. We don't want to just go to God asking for things, but to thank God for what we already have first. Many people are encouraged when they hear the praise reports about what God is doing. It reminds us that God is good and does answer prayers. After praise reports, people share prayer requests and we pray for one another. I often pray for people, but so do other callers as well. When someone has received breakthrough or blessings in an area, that gives them authority; so such people are often asked to pray for those still going through trials. Callers also share testimonies and prophecies as the Holy Spirit leads. As I said this is a real meeting so it's important that callers participate. I understand that some like to quietly listen, but if everyone only listened then we wouldn't have a meeting. Some people are shy about speaking and praying out loud, but God has not given us a spirit of fear; and praying over the phone is probably easier than praying in front of people. It's a good way to practice praying if you are shy. Please don't let fear or shyness hold you back. People call from all over the nation. Everyone has a different style, and that makes it beautiful and interesting. Sometimes people who are really shy, or unable to call in, will email or Facebook me with their prayer requests. This is acceptable also. I understand that there are times when it's struggle enough just to make the call. The fact that you showed up is good; speaking is encouraged but not required. You can also participate by silently praying and joining your faith with ours. The other callers won't know you're on the line unless you tell them. As the host I am able to see from the web how many callers are on the line. If I have your contact information stored, then your name will often come up on the screen. No one sees this information but the host, and I keep your information private. Regarding privacy of information shared during the calls, I encourage callers to share as they are comfortable and as the Spirit leads them. You don't have to share specific names and locations. God knows all the details. There are meetings Thursday evenings, although the time occasionally fluctuates. Check the website and social media for conference times. Meetings are often about 1.5 hours but it varies. Sign up here to be notified about Events: http://eepurl.com/-YTmz or here: http://eepurl.com/S64xD. The basics are call 218-895-4573 at the designated time. 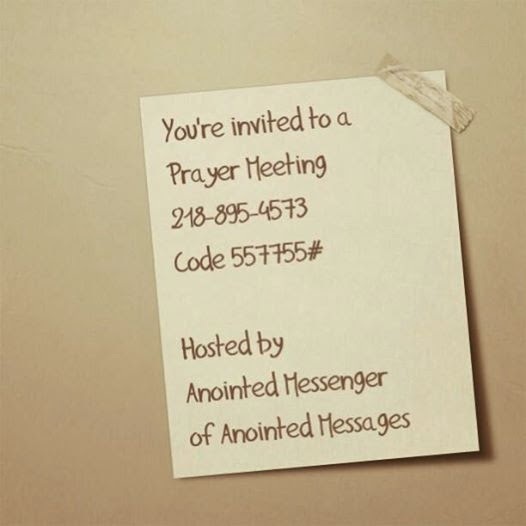 You will hear a message welcoming you to the Anointed Messages phone line. If you don't hear Anointed Messages you may have entered the wrong number. Similar numbers are used by other ministries. One caller told me she heard a recorded message saying there was no conference scheduled; but after double checking she realized her dialing was a number off. When prompted enter pass code 557755. You will be asked to enter the # sign after the code. Calls usually begin in open conversation mode. This means we can all speak and hear each other. You can mute your line by pressing *6. You will still be able to hear the call, but we will not be able to hear you or any noise in your environment. Pressing *6 again will un-mute the call. In Q and A mode, all callers other than the Host are muted. To speak you "raise your hand" by pressing *6. If you ever need help press *4 for conference instructions. If the call is being recorded you will hear an announcement notifying you of such when you first call in. If you want to share sensitive information that you don't want recorded please let the host know right away. Most conferences are not recorded. So far no recordings have been shared with the public. If you are speaking for the first time during the conference it's nice (but not required) to identify yourself. You can identify yourself by your first name and/or location, etc. This helps reduce confusion and makes the conference easier to follow for everyone. Be mindful that you can't see who's on the line. Many times people have referred to the group as "sisters" only to learn there are men silently listening, etc. If you join the conference late, or have to leave early please try to do so quietly and discreetly. There's usually no need to interrupt the conference. People drop in and out as they are able; I understand people's schedules vary and people are welcome whenever they can attend. We ask that you follow general rules of civility. Don't interrupt others when they speak, and if you get carried away with your "Praise the Lord's" and "Amen's" it may be better to mute your line. I love Amen's and participation, but it should not disrupt the speaker. If you are in an environment with lots of background noise, please mute your line so it will not be heard in the conference. The main rule is the conference belongs to the LORD. We want the Holy Spirit to have His way so we stay open to His leading. Thank you for your interest and I look forward to praying with you! Feel free to leave a comment. Your feedback is welcome.